From The Street To The Show, Here's Everything You Need To Know. 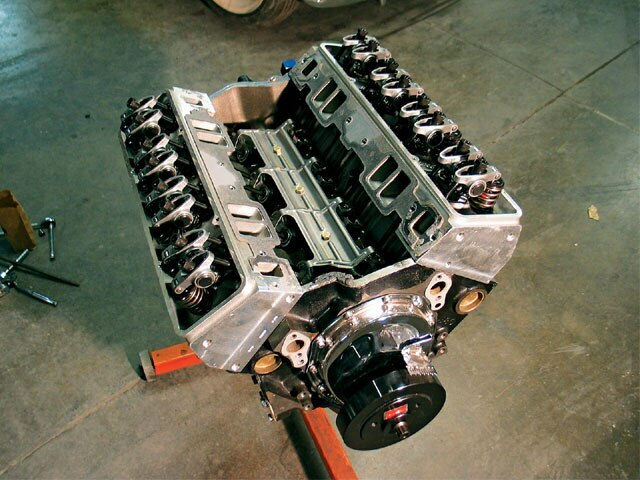 What do we mean when we say “from the street to the show?” Well, we decided to “candy out” this engine block that used to be in a street car. The engine was partially disassembled and prepped for that bling finish. 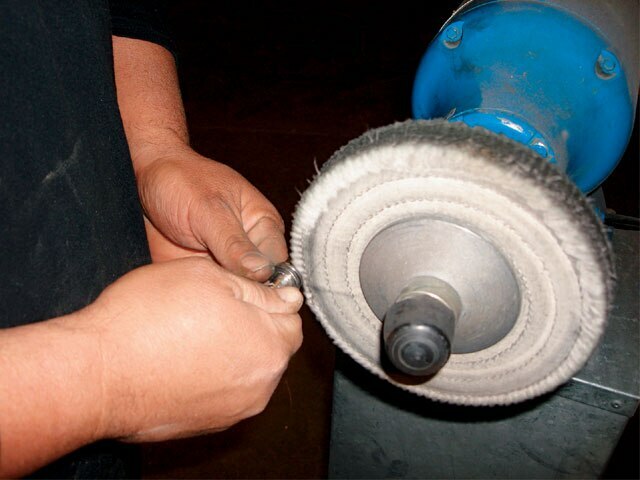 Just like basic body work, the better the prep work, the better the finish. This tech article will hit home for our Midwest and East Coast readers who normally build their cars during the winter season. We had to use heaters to warm up the engine and the area that we were using to spray. If you do this, you need to be careful and make sure that you spray with the heaters off as the paint is very flammable. You also need to be careful if you’re going to use heaters to dry the coats of paint and not turn them on with the fumes in the air as you can cause an explosion if there’s no ventilation. Whenever you paint, make sure to wear a mask and work in a well-ventilated area. 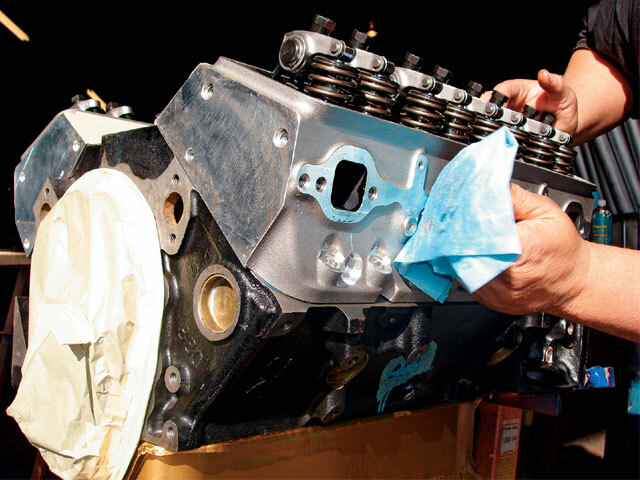 After being disassembled, the stroked-out engine was prepared and wiped down with lacquer thinner to remove any oil. All of the internals were covered up as we wanted to make sure not to have paint inside. 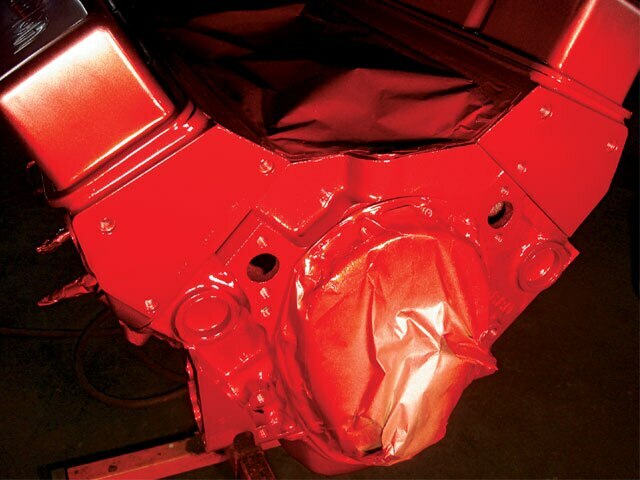 Removing the oil and other chemicals will help prevent any type of chemical reaction, and a clean surface will also allow a better bond between the paint and the block. We also used high-heat primer as a sealer and binding agent for the SEM paint that was sprayed on. With minor elbow grease and degreaser, this engine was built up from the street to the show. Now follow along as this engine was painted and built back up on the weekend to get it ready for the upcoming show season. 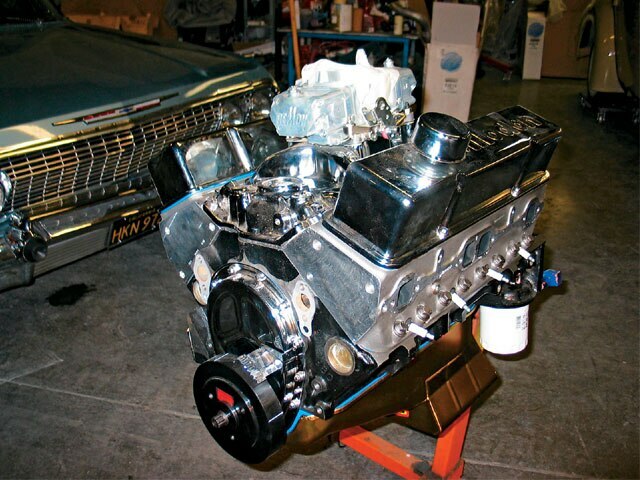 This engine was ready to be dropped into a lowrider and taken to the show. 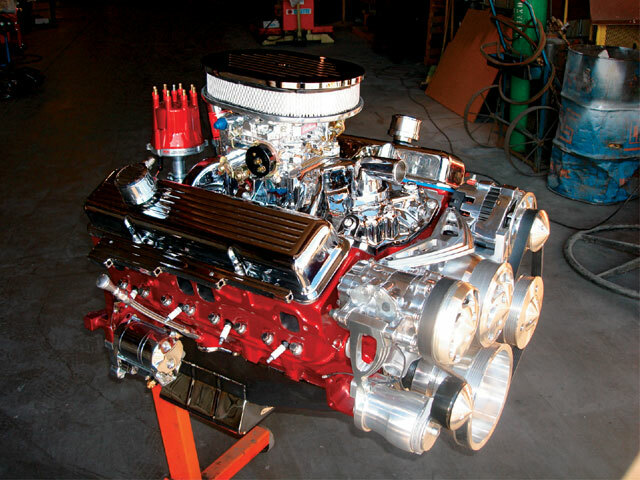 This engine’s in need of candy paint and a few other add-ons before it wins any shows. 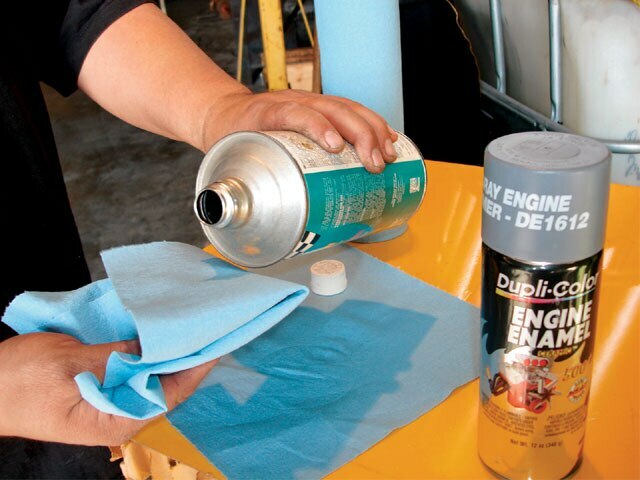 We picked up this Prep-All and Duplicolor high-heat engine primer from the local auto parts store. We plugged up all of the exhaust ports on the heads to make sure that they did not have paint on them when the engine is fired up for the first time. 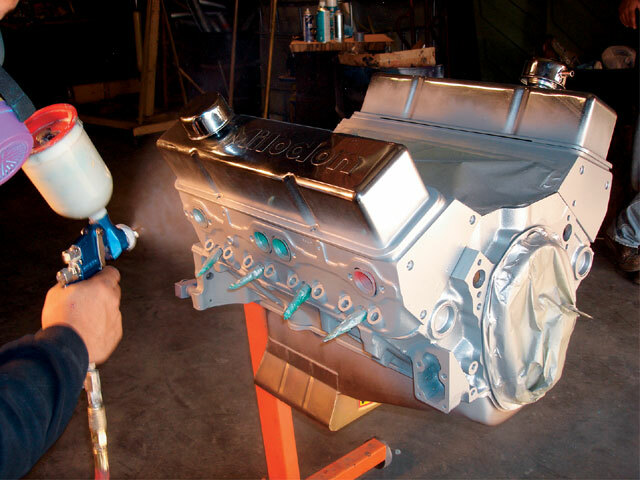 The assembled engine was taken slightly apart to allow us to prepare it and spray it without any glitches. Once the engine was apart, it was wiped down with Prep-All to make sure that all of the oil was off of the block to avoid any chemical reactions. 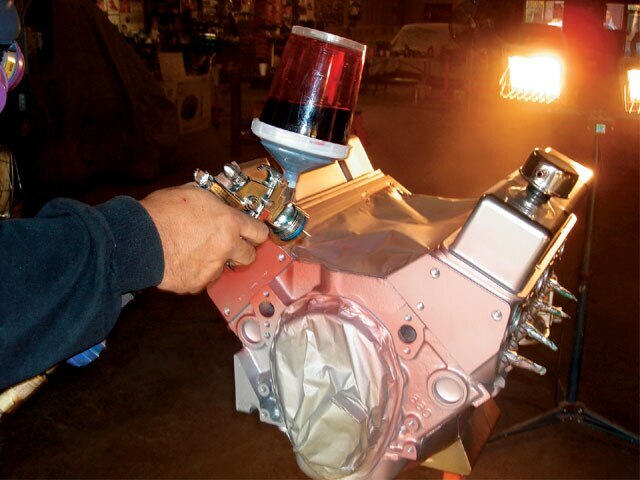 The engine was carefully masked off to keep the paint from going into the internals of the block. The engine surface was warmed up using a propane heater. Make sure you that you do not paint with the heater on as you can cause a explosion. 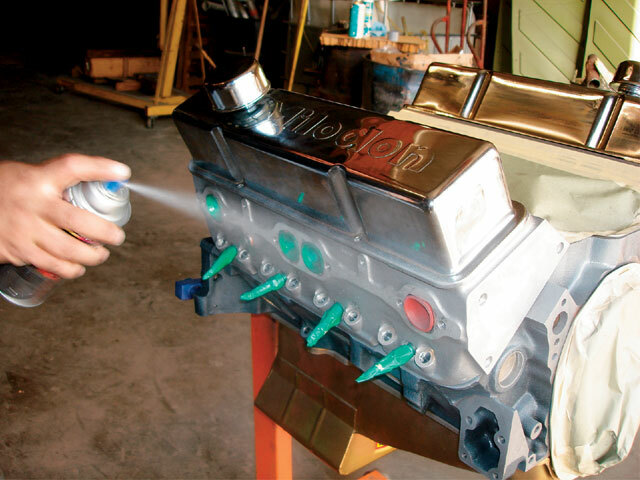 Once the engine was at a desirable temp, we started misting the high-heat primer. 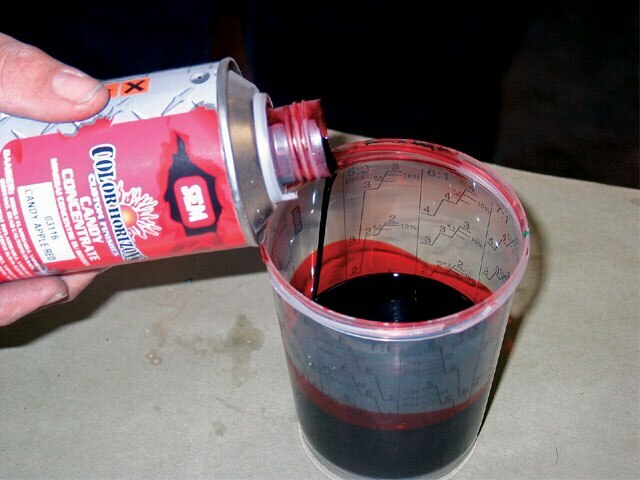 Using SEM’s candy concentrate, the candy red color was mixed. After adding catalyst, the transparent color was ready to be sprayed on in several coats. The results of several even coats was a color that was glowing. 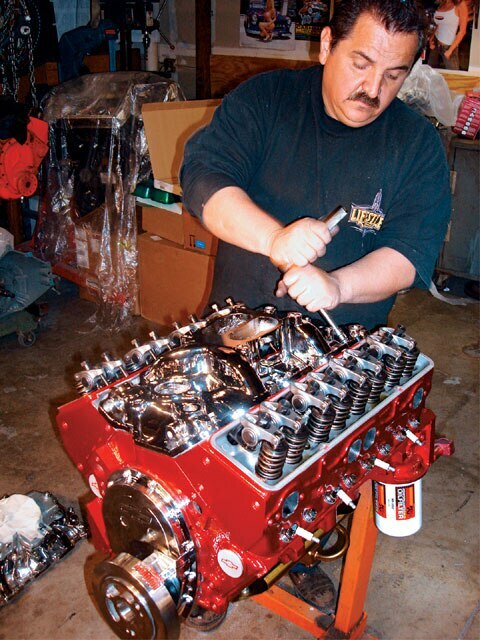 Once prepared, the distributor cap went through the same steps as the engine as they were painted simultaneously. Here’s a look at two different styles of distributor caps that were painted and left to dry. 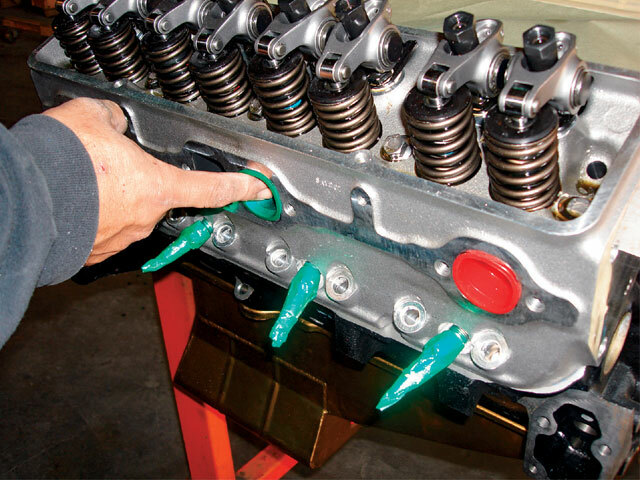 While the engine paint was left to dry for two to three days, details like the ARP engine bolts were polished to add custom detail to the engine. The custom engine was coming together as accessories including this Professional Products chrome intake were used to give it a show finish. 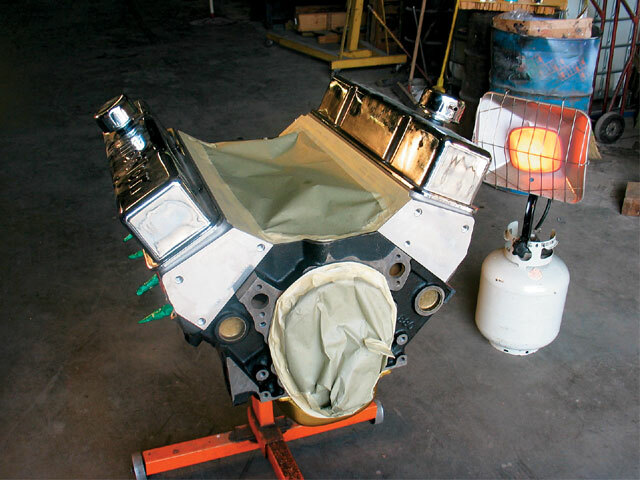 The sealed and primered engine was covered with SEM’s metallic silver base. 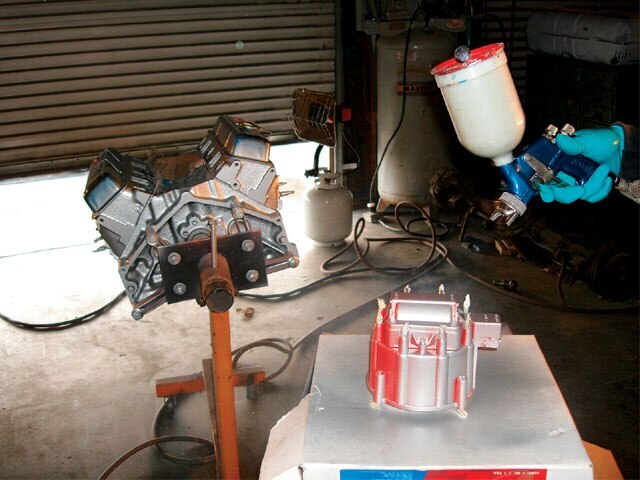 Using the SATA Jet 3000 with a quick release cup allowed us to see how much material was going onto the engine block. As you can ee, the color goes on lightly and in several coats at a time. 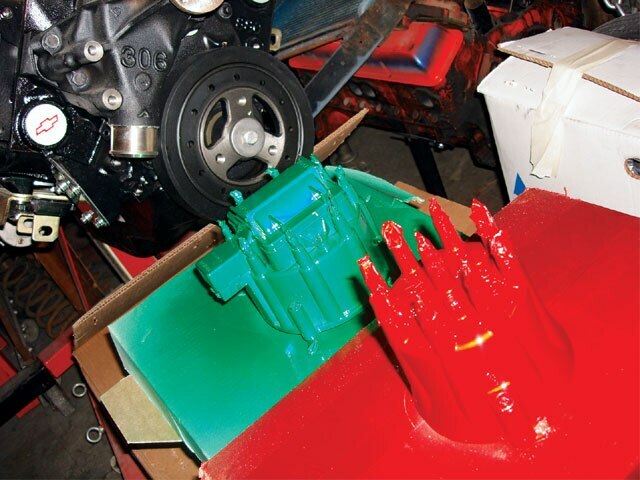 With this being a show engine build, we also decided to paint the distributor to match the engine block. 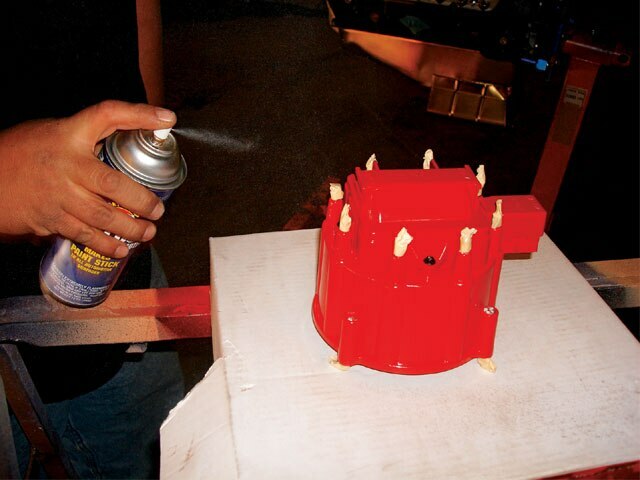 With the cap all masked off, the distributor cap was shot with Bulldog, a binding agent that allows the paint to adhere to the plastic foundation.